Sarah knows the skills, confidence and qualifications she picked up during her 16-week Crew-it course at Porter's Coffee Shop & Bistro in Colwyn Bay were vital in helping her back into the workplace after several years. “It was great to get the qualifications Crew-it offered, and it's those which have really helped me to get a job," she said. “Because I did first aid and health and safety training here, that really worked in my favour. 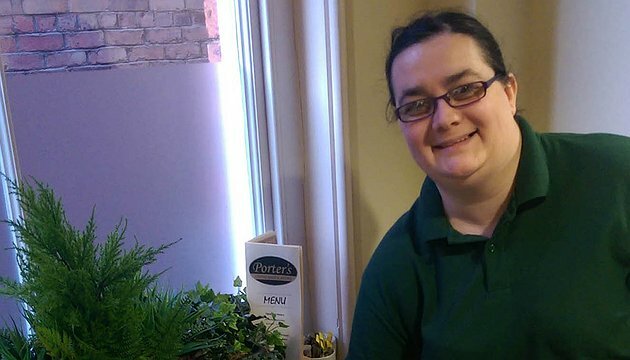 Enthusiastic Sarah, 33, has continued to volunteer at Porter’s even though her time on the course is over – because she believes the experience will help her career and give her CV extra sparkle. Crew-it offers participants on-the-job training in customer service, catering, food preparation, barista and bistro roles, as well as a dedicated adviser to help with job searching, CV writing and employability and interview skills. CAIS delivers the Crew-it programme with the help of valuable support from Conwy County Borough Council. Branches of Porter's Coffee Shop in Colwyn Bay and Rhyl, Troop Cafe in Llandudno and Colwyn Bay meeting and events venue Station Court all offer opportunities for on-the-job training, work experience, accredited qualifications, and more.